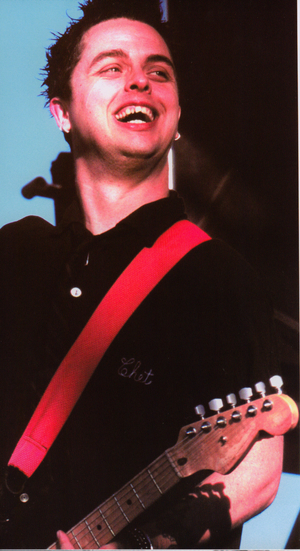 I'm a 25 year-old BIG Green Day fan from Massachusetts, and I've been playing self-taught guitar since the age of 11. I'm an avid Green Day collector, too, checking eBay consistently since 2001 to browse and occasionally buy rare vinyl, CD singles, and now the Holy Grail. 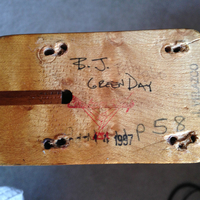 I've stumbled upon an eBay auction titled "Fender Custom Shop Maple Strat Neck belonged to Billie Joe of Green Day." Something like this never happens, it's unheard of. I checked the auction every day until it ended and for what I can only imagine as a combination of skepticism and a steep asking price, I won the thing as the lone bidder for around the price of a Mexican Fender Stratocaster (about $300-$400). I was floored - still am. The seller said that he rented out tour buses in the 90s, and had Green Day take one of his buses out on a leg of the Nimrod tour. While cleaning out the bus afterwards, this guy found the neck abandoned in a closet. 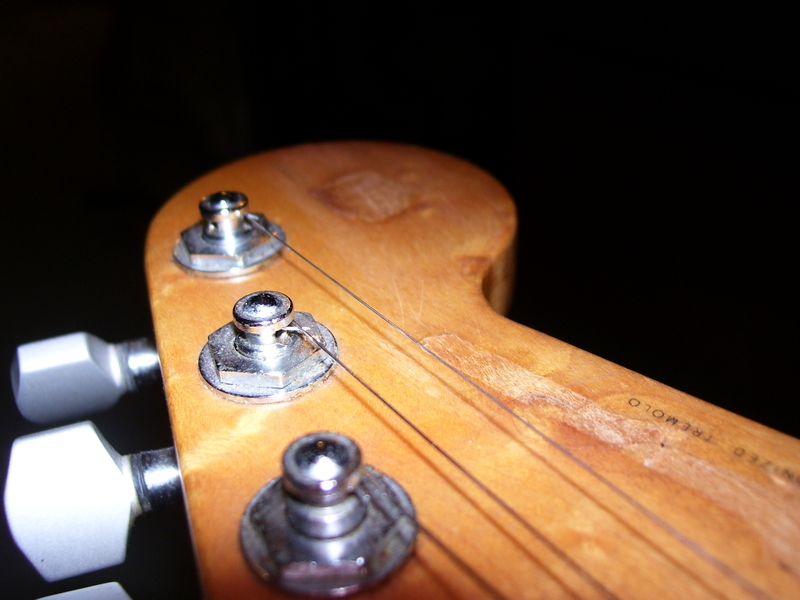 The band never returned his calls about this heavily road-worn used neck. 14 years later, he lists it on eBay. 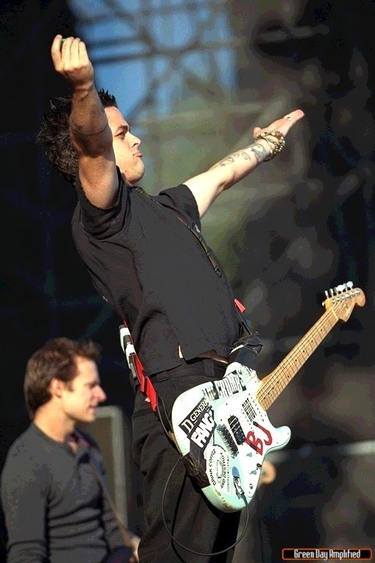 Around 1997-98, Billie Joe had Fender make him at least one copy of his stickered Stratocaster affectionately named "Blue." 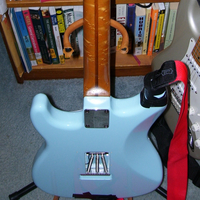 It had stickers from The Crumbs and D Generation on it with the Fender logo brazenly sanded off of the headstock. This was the first guitar I thought to compare with the eBay item. The birdseye marks and fretboard dirt match up to a T with several photos and videos. This is the one! 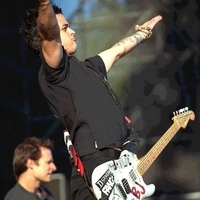 I was hardly a skeptic, as to its authenticity, but only to which exact guitar of Billie's the neck came from. 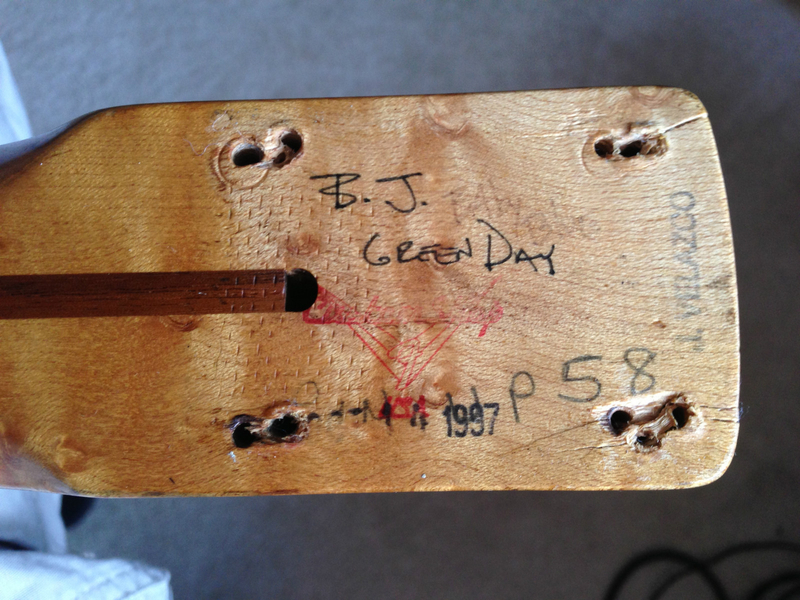 A telltale sign, though, was that Billie Joe signed the neck "BJ - Green Day" in pen below Fender's date stamp, which shows an illegible month and the 4th day of 1997. Scrawled in light pencil also reads "baby blue." Fender marketing confirmed that it's a Fender, and I found out myself that this neck was on a guitar played at such infamous televised performances as MTV's Live At The Ten Spot and HBO's Reverb from Vancouver. I wasn't planning on owning any more guitars but felt obligated to do the right thing. 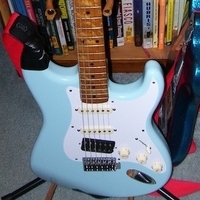 I went ahead and purchased a daphne blue Fender 50s Classic Series body, the GraphTec saddles, a Seymour Duncan JB, and all the other parts needed. I essentially recreated the guitar as a whole that his neck was supposedly smashed right off of, as the story goes. The fat 50s style neck fits so comfortably in my hand, complimented with the worn down thin-style frets. 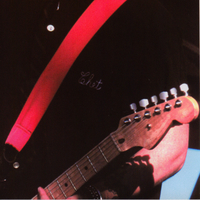 Billie even left a set of after-market Sperzel locking tuners on the thing. 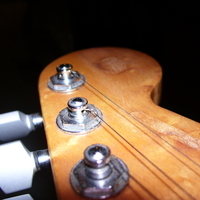 The luthier who helped assemble this had trouble fitting the neck to the body. So was this neck really custom made then? Does the original "Blue" have a slightly larger dimension at the heel? All these little questions are serious in nature to a guitar player, and the man with the answers is none other than the guy whose poster is on the walls of millions of teenagers, and whose influence still to this day pervades punk scenes of all ages, countries, and continents. Rock 'n roll!